EC541A-II: For individual operation of a single awning. Can also operate multiple awnings as a group. EC545A-II: For individual operation of up to five awnings. There is also a designated group channel for group operation of the five individual channels. EC5410A-II: For individual operation of up to ten awnings. There are also two sub group channels (channel 1 – 5 and channels 6 – 10) for operation of the two sub groups. There is a further group channel which allows operation of all ten individual awnings as a group. 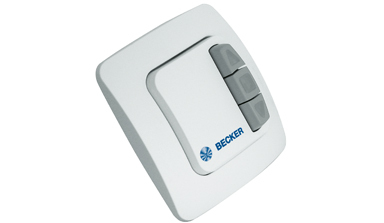 If there is concern of misplacing the hand held remote, Becker offers the single channel and five channel versions as a wall mounted option. EC311A: For individual operation of a single awning. Can also operate multiple awnings as a group only. EC315A: For individual operation of up to five awnings. There is also a designated group channel for group operation of the five individual channels. 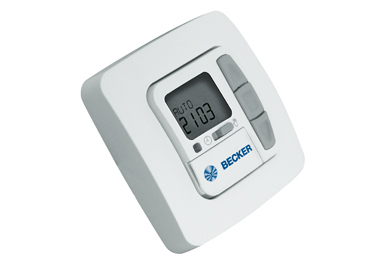 Becker offers a range of timers that allow the consumer to pre-program one UP time & one DOWN time per day. Individual times can be set for each day of the week, times can be grouped into MON – FRI & SAT – SUN, or the same time for each day of the week can be programmed. This function can be activated so your awnings operate at the designated sunset & sunrise times. This function can be activated when you are away so to give your home the appearance of being occupied. Your awnings will work at random times from the time that has been set. This is available as a wall mounted radio switch or a hard wired switch. SWC241A-II (Wind or Motion Sensor Remote): For individual operation of a single awning when used with a motion sensor or wind sensor. 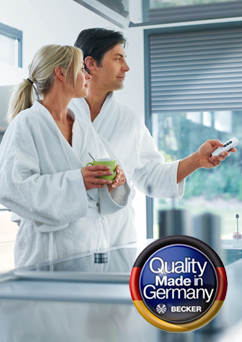 Adjustment of the sensitivity of the sensor is done through an adjustment dial on the back of the remote control. Can also be used to operate multiple awnings as a group. 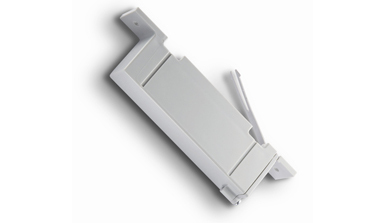 SWC441A-II (Sun & Wind Remote): For individual operation of a single awning when used with a sun and wind sensor. Adjustment of the sensitivity of the sun and the wind sensor is done through adjustment dials on the back of the remote control. There is also a sliding switch that can be used to turn OFF the sun sensor should this function not be required. It can also be used to operate multiple awnings as a group. SWC411A-II (Wall Mounted Sun & Wind Remote): A battery powered radio controlled wall mounted switch for individual operation of a single awning when used with a sun and wind sensor. Adjustment of the sensitivity of the sun and the wind sensor is done through adjustment dials on the front of the switch. There is also a sliding switch that can be used to turn OFF the sun sensor should this function not be required. It can also be used to operate multiple awnings as a group. SWC545A-II (5 Channel Sun & Wind Remote): For individual operation of up to five awnings when using either a motion, wind or Sun and Wind Sensor. There is also a designated group channel for group operation of the five individual channels. 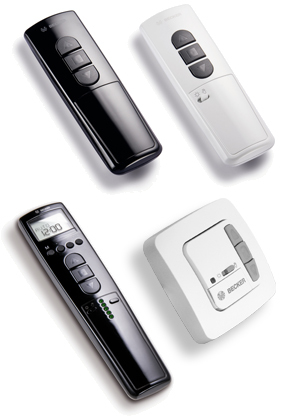 Remote comes with simple LCD display allowing preset times to be set for the automatic operation of the awning. 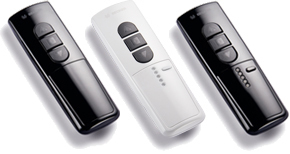 Adjustment of the sensitivity of the motion, wind or sun sensor is easily adjusted from with a menu in the remote control. The wind sensor can be used to offer protection for your external awning from damaging winds should it have been inadvertently left out. It is mounted on the façade above your awning and measures the conditions of the day. The wind speed you would like the sensor to activate the awnings to retract is set through the remote control or wall switch. Once the wind sensor activates the awnings to retract, the awnings are disabled whilst the wind remains above the preset threshold. This is available as a remote control version, 240V powered (SC711A) or as a hard wired version (SC71). The motion sensor is designed to offer protection for your Folding Arm Awning against damaging winds should it be left out. The motion sensor is mounted on the front bar of the awning & measures the movement of the awning. Once the movement of the awning becomes too aggressive the sensor will retract the awning. The sensor also offers a second function, inclination. This is primarily used when the awning comes straight out and doesn’t allow water to run off it. Once the inclination function is activated the sensor will measure the angle the awning is on. Once the angle changes by a preset level, the sensor will retract, preventing dangerous levels of water pooling in the awning. This is only available as a remote control version (SC211A). It is powered by two AAA batteries that should be replaced every twelve months. This is a combined sensor that measures both level of sun as well as the level of wind. This type of sensor offers you the ultimate in automation allowing protection of furniture, reducing heating costs in your home and protecting your awning from damage. The sun sensor is designed to bring the awning out when the sun is starting to hit the windows of your home, then will take them back as the sun goes down. 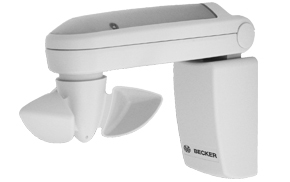 The wind sensor is also there to offer protection to your awning should the winds become too strong. It is available in two versions by remote control. 240v Powered (SC811A) or Solar Powered (SC861A) or as a hard wired product (SWC52). Should you be concerned about rain damaging your awning then a rain sensor can be fitted to retract the awning should it have been left out when it starts to rain. EC52: The most basic form of switching is a hard wired three position switch. Offering UP, DOWN & STOP functions in either a fixed or momentary mode. Power is required to the switch as well as wiring from the motor down to where the switch is located.